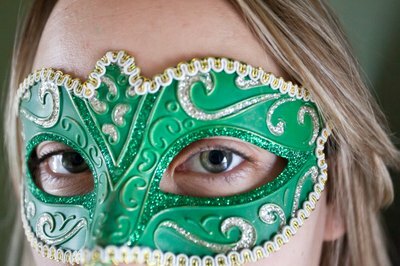 Whether you're planning a celebration with a masquerade theme, or have been invited to a masquerade costume party, you'll want to make sure that you look your best for the occasion. Learning a few tips for putting together an eye-catching ensemble will impress party-goers and make the get-together much more enjoyable. Select black clothing to wear to the party; black leggings or jeans, and a black shirt that matches the weather and location of the party. For instance, if the party is outdoors in the summer, a black tank top is best. 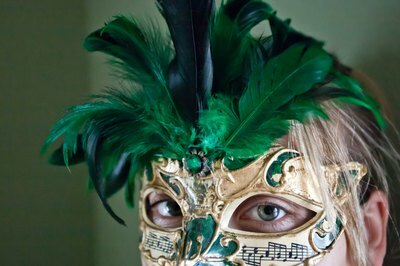 Purchase a masquerade ball mask that features elaborate colors or designs. For instance, a mask with three or four bright colors like turquoise, red or purple will definitely stand out against your black clothing. Or, select a mask with an attractive color but even more appealing shape, like a mask in red complements black clothing well, but can be shaped to cover half of your face vertically instead of the standard horizontal mask. Add features to your mask if the one you've purchased isn't flashy enough for the party. Glue feathers in the color of your choice around the mask border, or line the mask with a string of synthetic pearls in a bright hue. 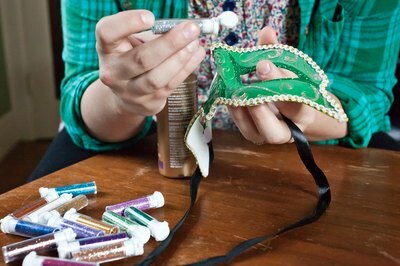 Or, apply glue to half of the mask and immerse the section with the glue in glitter for a sparkly effect. Select a costume that matches the look you want. If you want to attend the party as an Elizabethan queen or princess, visit the local costume store for an elaborate gown with a full skirt and gold or silver accents. Or, if you're going as an animal, purchase a leotard that will further display your costume's theme, like a velvet black leotard for a panther. Choose a mask that isn't too flashy, so that your costume will be especially noticeable. For instance, if you've chosen a queen costume and your dress includes metallic colors, select a bronze mask to wear to the ball. Add a few more features (if desired) to the mask to complete your costume. For instance, to give your mask just a little more appeal, roll it in glitter of the same color to make the mask a little more noticeable and elegant.